Wednesday night's storm packed quite a punch, sending more than 68,000 lightning bolts through Midwest skies. Besides creating an illuminating show, lightning did some damage, especially in Carol Stream. 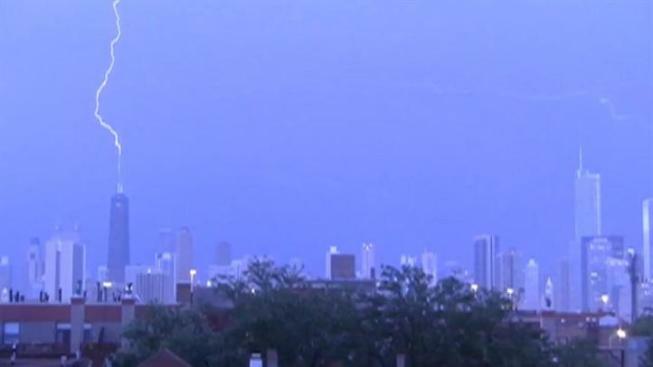 By the end of the overnight storms, about 82,000 ComEd customers were left powerless and rain levels created a new July record. The storm was not only a shock for some area homeowners, but also for the famous bell tower from the 1993 Bill Murray movie "Groundhog Day". The bell tower, located at the Woodstock Opera House near the 120 black of Van Buren Street, was struck by a large bolt of lightning around 11:30 p.m., according to the Chicago Sun-Times. The bolt also damaged the building's electrical system, air conditioning, heating units and smoke alarm system. Another strike sparked a house fire in Schaumburg, sending the 83-year-old homeowner into action. Dan Grueneich and his wife were asleep when they heard a loud noise and then saw flames coming from their roof. "I got the hose out and I was hosing it down when [the firefighters] came," Grueneich recalled. The couple moved into the house last September and had just finished renovating it. Now that work will all have to be redone, he said.